Pâte Brisée (pronounced "pat-brissay") is just a very basic dough for pie and tart crusts. It's made almost entirely of butter and flour, but that doesn't mean you can toss everything in a bowl and bake. French technique transforms these simple ingredients into super light and flaky crust. The important thing to keep in mind is that when the dough bakes, there must be a fair amount of water left in the butter to create steam and expand the pastry. As the steam escapes, it fluffs up the structure which creates a really light crust. This is the same mechanism that makes puff pastry so puffy. To keep the butter emulsified with water, everything must stay very very cold. 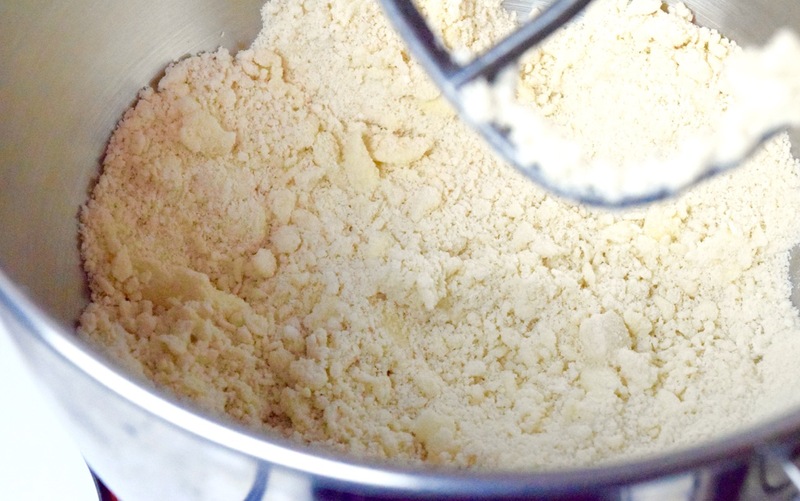 Refrigerate your mixing bowls, use only ice water, and do not work with the dough for too long without putting it back in the refrigerator every so often. A cold dough is also easier to roll out and less likely to crack when working with it. Typically for tarts, the crust should be "blind-baked" (baking before adding the filling) in advance. The filling, which can be lemon curd for tarte au citron or ganache for tarte au chocolat, is poured into the cooled crust later. Generally speaking, a baked filling will come out a bit more "rustic" having more cracks and an uneven surface. If you are preparing a baked filling, think about having a glaze of some sort to finish with a silky smooth and professional-looking surface. In pastry, perfection matters. Makes enough for 2 large tarts or 1 pie crust top and bottom. This is one recipe where weighing the ingredients is important to get the right ratio of flour to butter fat. With your fingers, pull the flour into the butter and pinch. Repeat this motion trying to break up the cubes of butter. If you start to feel the dough getting a bit greasy, stop. Toss everything into a bowl and refrigerate it for 15 minutes. The warmth of your hands can melt the butter, which will ruin your pâte brisée. The dough will not steam properly while baking and will have a hard and crunchy texture rather than being light and flaky. Keeping everything cold and a bit of patience will help you get the perfect texture. Clumps of butter are perfectly okay, and a good sign that you did not overwork the dough. Err on the side of larger clumps of butter if you are unsure when to stop. Turn the stand mixer on low and add the water 1 tablespoon at a time until the dough just comes together. Be careful not to add too much water, the dough should look like it is just barely held together and should not be moist or wet. It will become more uniform as you knead it. Work the dough with your hands until it is smooth. Divide into two balls. Flatten each ball a bit into thick disks. Tightly wrap each disk with plastic wrap and place them in the refrigerator for 30 minutes before rolling. If you are a newcomer to pâte brisée, let me warn you that this will be the most difficult part. As the dough moves outward, the edges will begin to crack since the inside is trying to expand while the outer rim is not. Be sure to address the edges periodically by going over them with the end of your rolling pin in a circular motion. It may be difficult to get it right at first, but you can always re-knead the dough, put it back in the refrigerator, and try again. Be sure to press the dough with your fingers so that it tightly contours the ring shape. You want as close to a 90° angle as possible. Place the unbaked tart crust into the freezer for 15 minutes before baking. This will make it more stable before baking and help it to hold it's form better in the oven. Since most people (myself included) don't have such a specialized pan, you can use pie weights to ensure the crust bottom stays flat and keeps a liquid-tight seal. 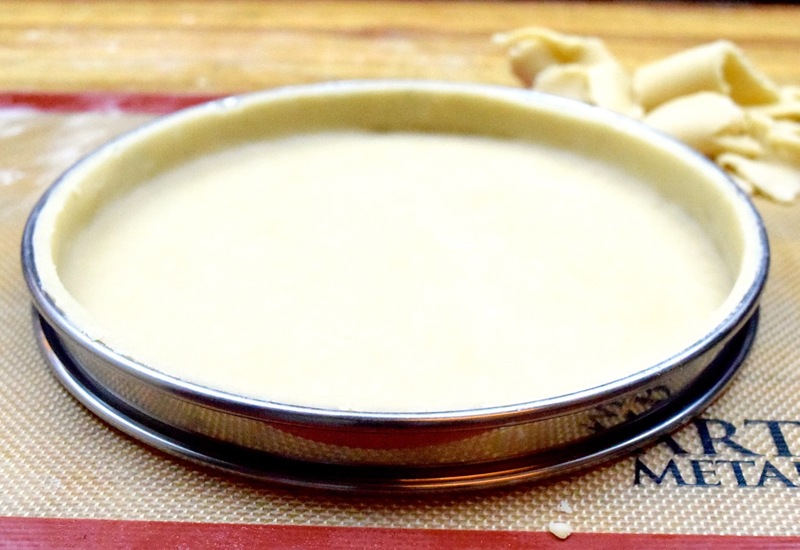 Cut some parchment paper or foil to a little larger than the size of your tart. Shape it to fit the inside with overlap. If your tart is not still cold at this point, put it back in the freezer. Now it's ready for baking. Bake at 375°F (190°C) for 20-25 minutes total. At the 15-minute mark, take the tart out and remove the pie weights, being careful not to spill them all over your kitchen. Place it back in the oven to finish baking.